Plot synopsis: After a woman picks up a hitchhiker, it soon transpires that he has just escaped from prison, and that he intends to carry out a murder in revenge for what he believes to be his wrongful conviction. Review: Unfortunately, the quality of an episode's star - in this case, Ava Gardner, in her only performance for Suspense - isn't always an indicator of the quality of the story. It begins promisingly enough, with an interesting game of verbal cat-and-mouse between Gardner's character and an escaped convict, as the two travel together on a journey that it quickly becomes apparent is going to lead to murder. Plus, there's a good twist midway through, when we discover that the protagonist isn't as sweet and innocent as she first seems. However, the contrived and convoluted plot eventually becomes pretty tedious, especially after the introduction of the husband, and the last few scenes lack real excitement, despite the fact that the audience knows that at least one of the characters is probably not going to survive to the end. Yet what finally kills the story is that by this point most listeners will have concluded that none of the characters is sufficiently likeable or sympathetic to care whether any of them lives or dies. Plot synopsis: Two reporters and a police detective, all involved in the case of a serial killer known as 'The Avenger', receive notes telling them to meet at midnight in a church, but after arriving at the appointed time each begins to wonder if one of the others might be the murderer. Review: Boring. Not the most sophisticated judgement, I know, but sometimes it's worth going with a first, instinctive reaction. I simply didn't find anything to hold my attention in this episode, and by the end had very little interest in finding out which of the three main characters was the killer. The script is adequate, but no more than this, and none of the characters has much personality. Nothing notably bad about the plot, hence my two- rather than one-star rating, but nothing to get excited about, either. Plot synopsis: A female insurance investigator, who assumes another woman's identity in order to use the latter's plane ticket, becomes embroiled in a case of murder. Plot synopsis: A female jewel thief is sent to prison for her part in a heist, and when she is released two years later, she discovers that one of her partners in crime has disappeared with the theft's proceeds. Review: Apparently based in fact, this story's most interesting aspect is that a woman is the mastermind of the criminal gang it features. The eponymous main character refuses to conform to female stereotypes of weakness and passivity, and takes no nonsense from the men around her; yet at the same time, she is quite prepared to use her feminine charms to try to get what she wants when it suits her. This mixture of qualities makes her a compelling character which, coupled with a fine performance from Deborah Kerr in playing her, elevates the episode considerably. The plot itself is fairly middling, and the story could be pacier, but this is still an above average episode, thanks to the strong characterization. Plot synopsis: A young woman, in an increasingly confused mental state, begins to wonder if she may have committed a murder, and should therefore confess to the police. Review: The murder plot at the heart of this story is nothing outstanding and the script is not especially dazzling - yet there is something about the episode that is nonetheless very compelling. Probably, it is a combination of the way it presents the central character's neurotic descent into guilt and self-recrimination, and the solid performance by Dorothy McGuire in portraying the woman's psychological deterioration. None of the other characters is particularly memorable, and though the plot's details will also likely be quickly forgotten, the episode's convincing depiction of a person experiencing an almost complete mental break lingers in the mind much longer. Review: Like 'Baby Face' Nelson, and Bonnie and Clyde, John Dillinger was one of the most famous criminals of the Depression era, whose notoriety has lasted right up to the present day. Dillinger has been the subject of numerous film versions of his life - from 1945's Dillinger to 2009's Public Enemies - which goes to show how much he has continued to fascinate both filmmakers and the public. 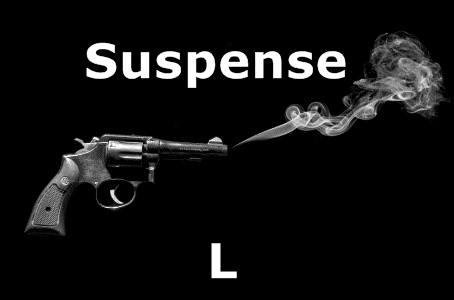 Unfortunately, though, this Suspense episode is not a very strong dramatization. To begin with, because it focuses solely on the end part of Dillinger's life, those who don't know much about him will be left little the wiser, including about his most infamous exploits. Nor is the plot especially thrilling, with not much in the way of tension or excitement. Perhaps the most notable aspect of the script is that - in contrast to many fictionalized accounts of the lives of celebrity criminals - it doesn't overly romanticize Dillinger: in fact, he comes across as quite an unpleasant, thuggish figure. Then again, such a depiction makes it hard to understand why we should be particularly interested in him. The character of Dillinger's girlfriend is slightly more sympathetic, but still not very interesting. On the whole, somewhat pedestrian. Plot synopsis: A woman fears that her husband, with whom she runs a struggling dude ranch, may have murdered a wealthy potential investor in order to steal enough money to pay off their debts. Based on a short story by Cornell Woolwich, 'The Red Tide', first published in Street & Smith's Detective Story magazine, in September 1940; and later, in revised form as 'Last Night', in his short-story collection I Wouldn't Be in Your Shoes, in 1943.
Review: Might a loved one be guilty of murder? This question provides the starting point for many a thriller - think films like Alfred Hitchcock's Suspicion and Shadow of a Doubt - as it does here. Specifically, the episode develops an exciting and compelling story centred upon a wife's growing anxiety that her husband may have resorted to killing in order to obtain the money they need to save their business. Based on a Cornell Woolrich short story, this bears many of the hallmarks of the type of noir tale for which he was famous, with its cast of ordinary people leading troubled, desperate lives, who find themselves caught up in a world of mystery and murder. Woolrich himself was apparently so impressed by this Suspense version that he rewrote his own story for subsequent republication in line with how the radio drama plays out. At any rate, this is a very good adaptation. Like many early Suspense episodes, it's a little creaky in places, and the music can be overdramatic and overbearing, but otherwise, a fine episode.